Quite a few people in the climate field have been showing interest in Project Drawdown and the Project’s anticipated 2017 book (and database) covering the 100 ways to best “draw-down” greenhouse gases in the atmosphere. The list is detailed and includes more than “pure” climate issues—for example, it includes education of girls. There’s nothing fundamentally new about arguing that we could address climate change “if only” we would scale up and deploy a particular technology or implement a particular social, technical, or political measure. Socolow’s “stabilization wedges” (2004), Randers and Gildings “1 degree war plan” (2010), Mckinsey’s mitigation cost curves (2007), Jacobsen’s 100% renewable electricity roadmaps (2016), all fall into this category of “if only we would . . . .” strategies. Unfortunately, acting on these strategies turns out to be much more difficult than coming up with the ideas. Will Project Drawdown’s 100 measures simply become another entry in the “if only we would . . . “ list? A lot depends on whether—along with assessing the “drawdown potential” of each measure—we explicitly identify and understand the barriers that prevent each measure from rapidly scaling up under the status quo and come up with strategies to overcome those barriers. In addition, we would be well-served to identify constituencies that realistically can mobilize to overcome those barriers. Ideally, such a “barriers and constituencies” assessment went into the identification of the 100 measures in the first place, but there’s no indication of that on the website or in Paul Hawken’s talks about the project. In other words, much depends on whether Project Drawdown envisions itself solely in a technology assessment role, or in the role of a chess player who is coordinating efforts to move the 100 Drawdown measures forward on an enormous Climate Chessboard. It’s not clear whether Project Drawdown has such an ambition. We hope it does. By Sector: which sectors dominate? By Key Barriers: where might we get the most bang for our buck if certain barriers can be overcome? By Drivers Behind Development of Solutions: what’s going to cause these measures to deploy at a level that leads to drawdown of GHGs? Do public policy mandates have to dominate the drivers list? By Constituency: who’s likely to be implementing the options, and how can they be motivated to want to do so? These explorations are preliminary; they don’t pull all the information together in order to prioritize certain options over others, at least in the near term. 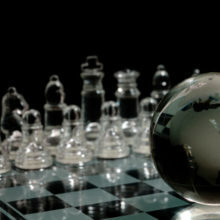 But they do begin to identify the steps involved in thinking through the idea of Drawdown Chess. The Climate Web also explores the larger topic of Climate Chess in much more depth, into which the idea of Drawdown Chess fits. Climate Chess is a complicated game. It’s a critical game to understand, however, if we want to more successfully tackle climate change. Project Drawdown could help. Let’s hope it does.